Sometimes I'm not in the mood to try a new truck; sometimes I want to eat food I already know I love. Other times, I hit the street in pursuit of a specific taste memory I want to relive. In these situations, I have a growing list of favorite menu items that I'm sure will be great every time. 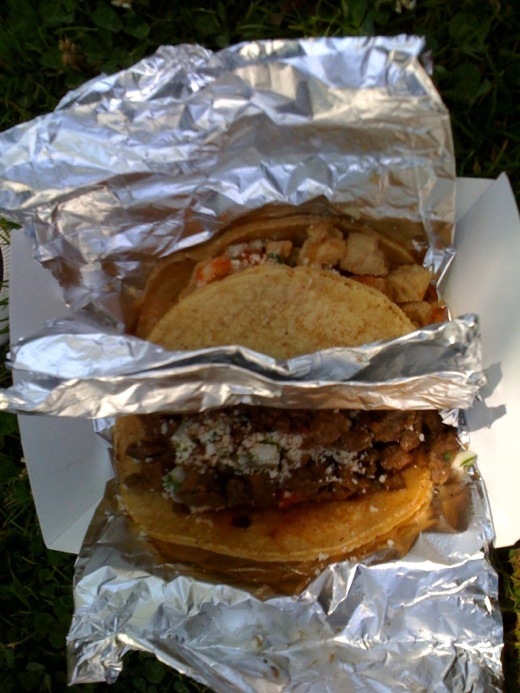 Here, in no particular order, are my 10 most reliably delicious food-truck dishes. 1. Bamwich, TastyMeat! ($8 for footlong, $6 for eight-inch version). Beef/lamb (hence "bam") shawarma wrapped in a pita, with romaine lettuce, roma tomato, red onion, tzatziki, red feta sauce and tahini. Shaved thin, the meat tastes like it's marinated in garlic, yogurt and vinegar, making it tangy and piquant. If you're a slow eater like me, get the eight-inch instead of the footlong - it's less likely to fall apart and unleash its innards into your lap. 2. 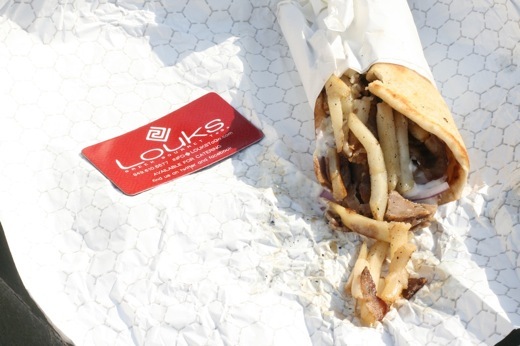 Beef gyro, Louks To Go ($5). Beef, tzatziki, tomato, onion, and french fries all rolled up inside the best pita I've ever eaten. It's soft and tender, and you can taste the olive oil in it. Of all the meat options on the Louks truck, I've found the beef to be the most dependably delicious. This dish made me a raw-onion convert - I love their crunch and peppery bite in the sandwich, and I even love the crazy onion breath they give me, although I'm sure my friends and family aren't quite as enthused about that part. 3. Lemongrass chicken or pork banh mi, Phamish ($6). Considering how often I visit the truck, it's ridiculous that I haven't yet reviewed Phamish. This Vietnamese sandwich comes with pickled carrots and daikon, cilantro and jalapeno peppers on a baguette. I opt to leave off the garlic mayo. The lemongrass chicken and pork are intensely flavorful; while many friends of mine love Phamish's lemongrass tofu banh mi, I find the tofu soaks up a bit too much marinade for me - but it's still one of the tastiest veggie sandwich options in town. I tend to think the chicken and pork stand up better to the marinade's flavor onslaught, maintaining their own personalities. The bread is flat-out awesome - the outside's crunchy without being mouth-splintering, and the inside is pillowy soft. Of all the items on this list, this sandwich travels the best - it's the perfect to-go meal. 4. Crack chips, Chef Brian's Comfort Truck ($2). 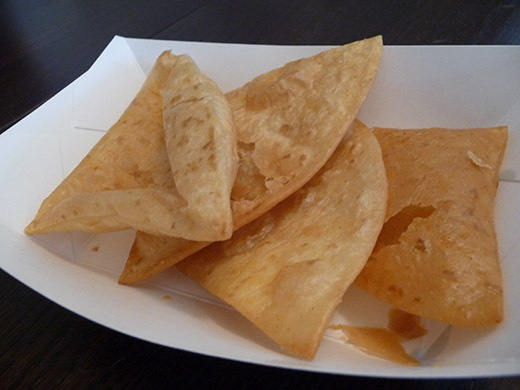 Oh, delicious deep-fried flour tortilla chips! Why are there only 6 of them in a serving? I've tried making these at home, but they never come out so gloriously golden. This is the only food-truck menu item I've brought home, eaten in five minutes flat, then considered driving all the way back to the truck immediately, just to get more. 5. Balsamic fig and mascarpone ice cream, Coolhaus ($5). Hunks of fig dot this dense, subtly flavored ice cream. Coolhaus' thing is that you get the ice cream between two cookies, but I barely notice them when I'm eating ice cream this good. That said, oatmeal raisin cookies work really well with the flavors of fig and sweet cheese. 6. Mini meat pie ($3 for two), Kabob n' Roll. I like my meat pies doughy, not flaky, and as deep-fried as humanly possible. These small empanada-like meat pockets fit the bill. The ground beef inside is rich with gravy. The pastry melts in your mouth. 7. Butter chicken, India Jones ($7). These tender chunks of chicken breast come in a thick, creamy sauce with a side of basmati rice. It's an appropriately sized portion rather than a gargantuan mound of food - which means you'll have room in your stomach to order several other items from the India Jones menu - and it's been consistently good every time I've had it. 8. Holding the joint number 8 spot are: the carne asada taco from KO Tacos ($2.50), and the carne asada taco from Don Chow Tacos ($2).The KO taco's filled with super-juicy beef and tangy, crumbly cotija cheese. Don Chow hasn't been around my neck of the woods lately, and I've missed regularly nomming on their perfectly seasoned carne asada taco. 9. A hot dog from The Greasy Wiener. When you have a hot-dog craving, the Greasy Wiener satisfies every time. You can go for the basics if you're in a no-frills mood: the Greasy Wiener's namesake dog has mustard, grilled onions, a dill pickle spear and one topping (we get sauerkraut). If you'd like a bit more 'zazz, go for a Berkowitz, a bacon-wrapped dog with chili and cheese. Your craving for a dog may lead to a burger jones - ours often do. If so, the Wiener has Iggys: two Angus beef sliders topped with American cheese on King's Hawaiian rolls. They're a no-fail burger solution. 10. Barbecued meat, Barbie's Q ($8 for a sampler plate). Whether it's pulled pork, barbecued beef, or smoked chicken, the meat on this truck is absolutely top-notch. A friend once skipped the sides (excellent collard greens, cheesy grits, and mac and cheese) and ordered nothin' but a big old plate of meat from Barbie's - and that was his entire dinner. That's pretty much a ringing endorsement right there. Oh, and by the way? He ate that plate - and then he ordered another one, to go. I considered adding some other menu items to this list, but I can't yet call them reliable: either I've only had them once, or I sampled them a second time, only to be ever so slightly disappointed. That said, I hope to be adding more dishes to the list very soon. One item I would love to include: the cheeseburger dumplings from Dim Sum Truck. I was so disappointed on the first Melrose Night when the truck sold out of them before I got a chance to order any. You will not thwart me twice, oh elusive dumplings! I may have only eaten you once, but, by God, I shall have you again! What are your most reliably delicious food-truck picks? Post them in the comments, and we'll compile a reader-suggested list of favorites.